Hawaii Shibashukai performed Japanese traditional Shamisen with Ko’ula and Hauta songs for the last 10 years at the Honolulu Festival. Performances will include Ise-Ondo, Gion-Ko’ula and Miyagawa-Ondo is with Japanese traditional dances. 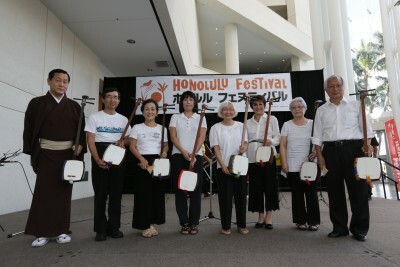 Hawaii Shibashu Kai was founded in 2010 by Kasuga Toyoshibashu, Shamisen instructor from Japan and performed Shamisen, Kouta and Hauata as a volunteer group at various places including Kuakini Hospital, Hawaii Senior Life Enrichment Association’s vents and Honolulu Festival. Hawaii Shibashuukai has currently about 20 members and welcome any newcomers who want to learn Shamisen. Hawaii Shibashukai is a group of Shamisen, Kouta and Hauta, traditional Japanese musical instrument and songs. Hawaii Shibashukai was founded in Honolulu in September 2010 with the leadership of Shamisen & Kouta Meastro, Kasuga Toyo-Shibashu and noa has about 20 students, The group has regular performance in every two years in Hawaii and performed on the stage at the last consecutive five Honolulu Festivals. In addition to these stages, the group performed Japanese music at hospitals and senior homes in Honolulu. Hawaii Shibashukai Shamisen & Hauta/Kouta group was founded in Honolulu in September 2010. Shibashukai performed at the last 4 Honolulu Festivals. Inbetween, we had special performances in Honolulu in 2012 and in Honokaa, Big Island in 2014. Hawaii Shibashu Kai is a group of local Japanese who enjoy to learn Japanese traditional music such as Shamisen, Kouta and Hauta under the stewardship of Shamisen Maestro, Shibashu from Japan. This is the fourth performance of the group on the Honolulu Festival stage.